Indulge in majorly chic vibes whenever you slip into these luxurious shoes. 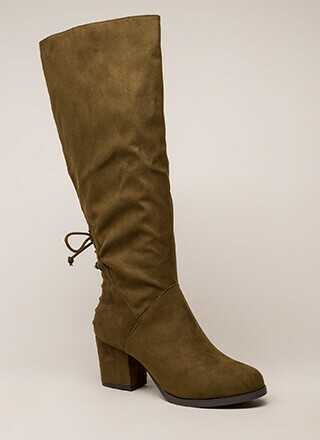 Fitted over-the-knee boots are constructed from soft crushed velvet and feature a rounded toe box, a chunky heel, and an adjustable drawstring top. Finished with a side zip closure and a ridged sole. Love the shoe heel height is great and material is comfy and soft. I was pleased they actually fit over my thighs however they were extremely tight around my toe, wanted to order larger size but they are all sold out for now. Waiting on restock!